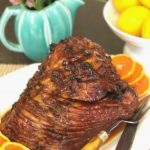 Rich, thick molasses punched up with bright, orange juice is turned into an extraordinary glaze on ham. 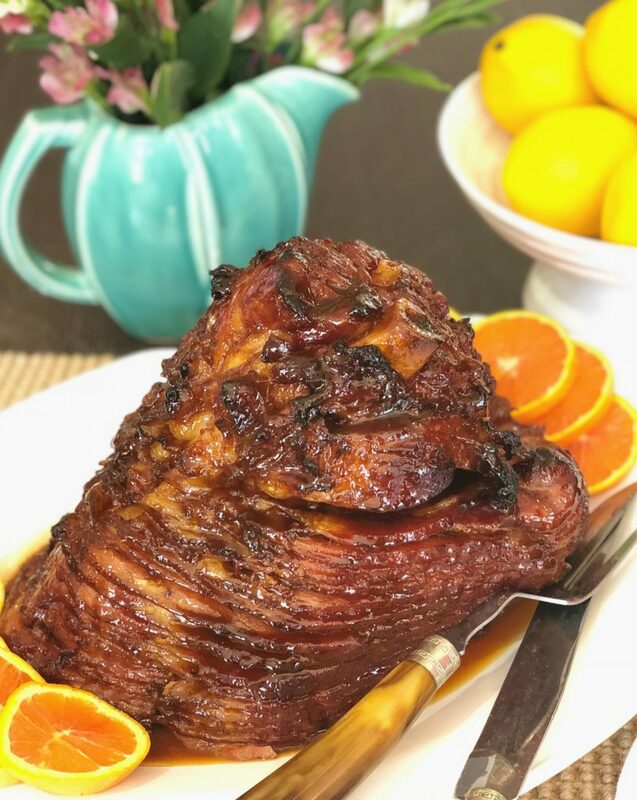 Once you taste this glazed ham, it will become your “go-to” recipe and you’ll never have to wait in line for your holiday main dish again. 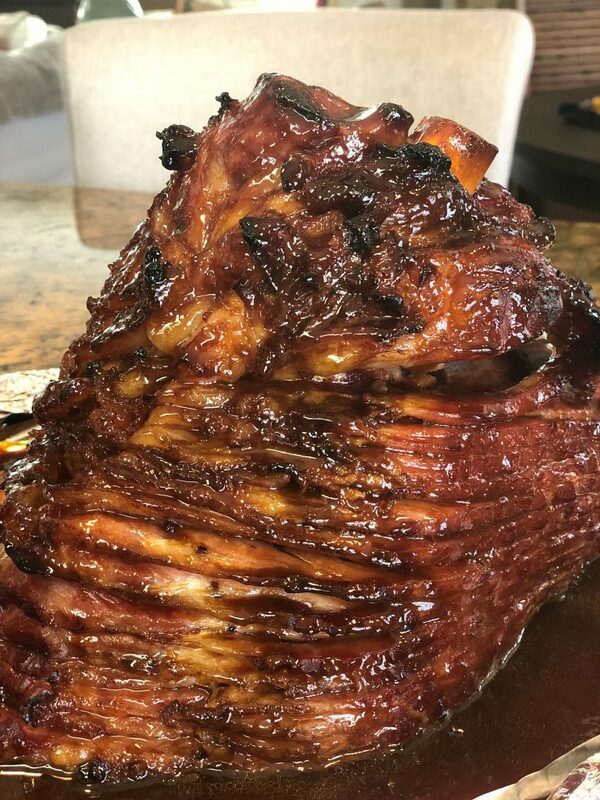 There’s just something special about a big, beautiful, glazed ham for the holidays. Like so many other southerner’s, serving ham is a tradition when family gathers to celebrate. Honestly, I’m not sure I’d know what to do if there was not a ham served during Easter or Christmas and even Thanksgiving for that matter. It’s just one of those food memories that bring such happiness which is one of the reasons I serve it. I want my boys to grow up with a few of the tried and true things I love and celebrating with special food is one of them. 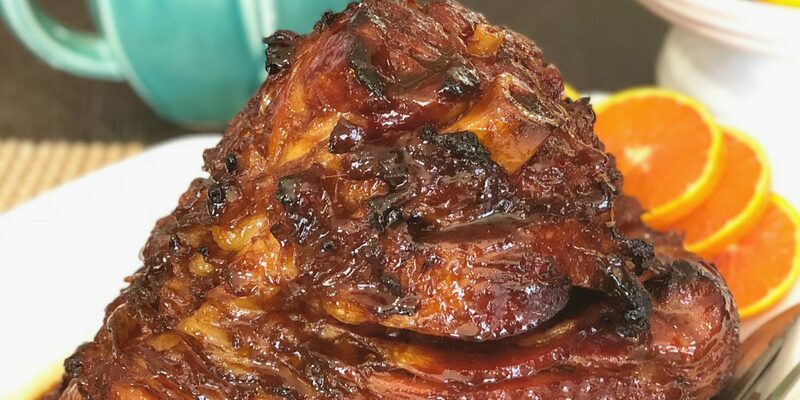 I have a couple of glazed ham recipes but this one is by far the most loved. It’s made with thick, rich molasses and orange juice concentrate with just a bit of ground ginger stirred in. 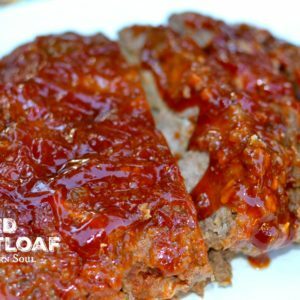 The glaze turns a dark brown color and when cooked with the orange juice, the beautiful aroma is magical. The key to success with this recipe is to make sure you buy a pre-cooked ham that has not been glazed. 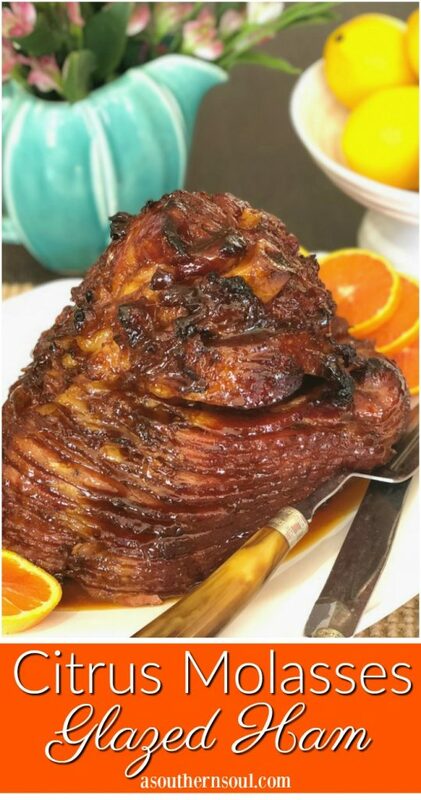 All you are doing is heating the ham so that once it’s done, you are just pouring over the glaze to give the outside skin and fat amazing flavor. I’ve never been a fan of the “honey-glazed” ham and feel it’s just way too sweet. The addition of the orange juice concentrate gives the smokey flavor of the ham a fresh zing that’s needed. 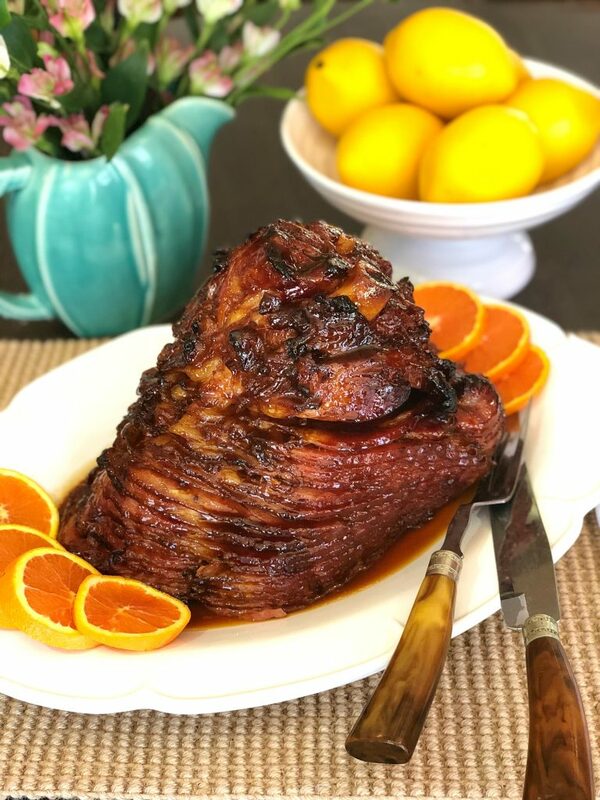 So, when it’s time to set the table and put out my best dishes, this ham is always among the favorites. There’s just something about keeping traditions alive with new moments shared around the family table. Heat oven to 325 degrees. 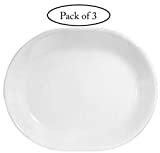 Line a roasting pan or oven proof dish with foil. Take ham out out packaging and place in pan, cut side down. Wrap with foil and securing tightly so that no steam is releases. Place in oven and bake for 2 hours. In a non-stick pot, combine frozen orange juice concentrate, ground ginger and molasses. Stir together. Cook on low, watching carefully so that it does not boil over, until glaze is reduced by 1/3 - about 15 minutes. When 2 hours cooking time is done, unwrap and pour 1/2 of glaze over ham. Place back in oven for 10 minutes. After 10 minutes, pour over remaining glaze and cook for last 10 minutes. 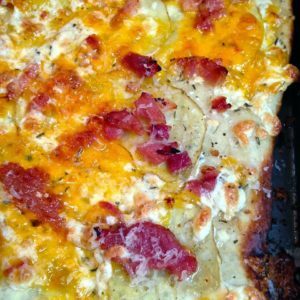 Remove from oven, let rest 15 minutes, the slice and serve. 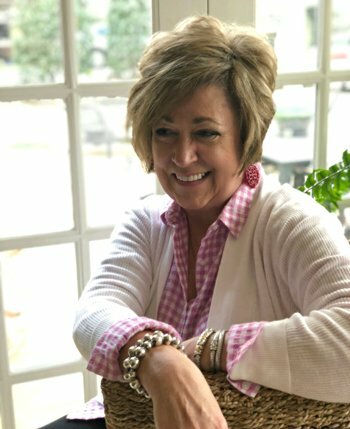 Don’t forget to PIN and FOLLOW A Southern Soul on Pinterest! 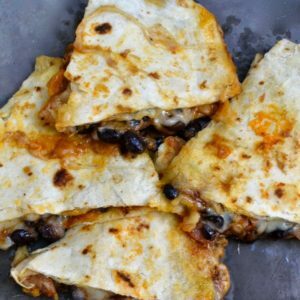 If you like this recipe and want more, then subscribe to our newsletter! A Southern Soul will be delivered right to your inbox. Donya, O.J. concentrate comes in various sizes. What size are you referring to in this recipe? Hey Pat. I think it’s the 12oz (smaller) container. Let me know if this helps. Happy Easter!